Classic French cinema is nothing new to the long running distribution company StudioCanal, Having previously released a collection of Jean-Pierre Melville’s films, and the complete works of Jacques Tati, their latest French release offers a rendezvous with one of France's most celebrated filmmakers, Marcel Carné, screenwriter Jacques Prévert, and star Jean Gabin for the 75th anniversary release of the poetic realist masterpiece Le Jour se lève (Daybreak). One uninspiring Wednesday afternoon I picked up the phone for an interview with Ginette Vincendeau, Professor of Film Studies at King's College London, to discuss this particular masterpiece. An author on the subject of French cinema who has tackled iconic French personalities on both sides of the camera - Brigitte Bardot, Jean Renoir and Jean- Pierre Melville, through to Mathieu Kassovitz’s modern classic La Haine, Vincendeau shared her thoughts on the reason Le Jour se lève has come to stand the test of time. Reflecting on its place both as a film of and out of its time sparked a discussion of what Le Jour se lève represents of French cinema's journey from the 1930s to the present day. Why has Le Jour se lève continued to endure? Ginette Vincendeau: Well to me it is a masterpiece, and the reason it has stood the test of time is because it was stylistically advanced when it was made - its use of flashbacks along with its wonderful noir photography - and was also one of the precursors of American film noir. The story of the working class hero, played by Jean Gabin, is very much of its time, as well as universal. He's a hero from 1939 who represents particular issues of the period - the anxieties before the coming of war and so on, whilst the story and the melodrama are universal. It's a tragedy of a man who falls in love with the wrong woman, and who is pushed into committing a crime by his passion. Can its impact be attributed to the input of multiple elements and individuals? 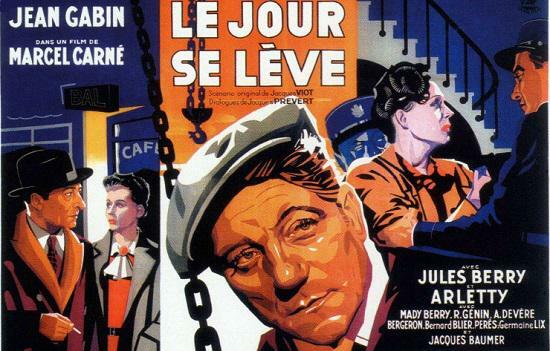 GV: Le Jour se lève is certainly a very good example of a film that gathers together a group of talents - director Marcel Carné, scriptwriter Jacques Prévert, director of photography Curt Courant and of course the star Jean Gabin - who were at the peak of their skills. Of course Marcel Carné and Jacques Prévert would go on to make Les Enfants Du Paradis during the war, but it's not the same. I think it is a team effort, and it is true that it is difficult to point to just one of them. The fact that they came together is another reason it has endured for so long. Was the film appreciated during its time? GV: Yes, the film was very popular, although it wasn't very popular for very long because it was released two months before the beginning of the World War Two. When the war started it disappeared from screens, but it did actually came back later on, and wasn't censored for the entire duration. When it came out it was hugely popular, and it was popular because the same team of people - including the star Jean Gabin who was the biggest star in French cinema at the time - had made Le Quai des Brumes together the year before. Le Jour se lève divided critics more than it divided the audience, and it certainly enjoyed a very successful release. It came out at the beginning of July and it was on until the declaration of war in September. So it's not one of those masterpieces that was misunderstood or ignored at the time. In your opinion have Carné, Prévert and Gabin become more appreciated with the passage of time or do you think they have become lost to recent generations? GV: Talking about Marcel Carné in particular, his reputation has had its ups and its downs. He was very popular and he was appreciated in the second half of the 1930s, and then during the war he made Les Visiteurs Du Soir and Les Enfants du Paradis, which were extremely successful. But there were problems after the war because he was criticised for having remained in France where he worked under the German occupation, and then when the young filmmakers of the New Wave appeared in the late fifties they also criticised him. He carried on working in the fifties and early sixties where he was very successful with audiences, but not with the critics. Nevertheless I think today his status has gone up again because several of his films like Le Jour se lève have achieved classic status. He remains one of the best known directors of French cinema. Could Le Jour se lève be described as a product of its time? Was it a reactionary film? GV: It is certainly a film that is considered to quite accurately reflect the anxieties of the time, especially the anxieties of the coming war. The film is very dark, and as I said you can see it as a precursor of film noir. The story is an extremely dark one since the hero commits a crime, is in love with a woman who has another man and then commits suicide at the end. Many people see it as reflecting the darkness of the time, but also the disillusion in the wake of the Popular Front era in 1936, which at one point was a period of great hope, especially for working class people, but which didn’t last very long. So you could say Jean Gabin as a working class hero does translate and express some of those feelings of disappointment - the anxieties. These were very troubled times, and Le Jour se lèveis a film that is seen to reflect them, although French cinema at the same time produced a lot of comedies and musicals. But it is Le Jour se lève that people look at in order to try to understand the period. There is a silent quality in Gabin's performance whereby everything is present in his expressions. GV: You can understand Gabin’s performance if you compare him to M. Valentin [Jules Berry], the man he kills. Berry was a very theatrical actor, and you can see that he uses his hands a lot, and he moves about and talks a lot. By contrast Gabin is very laconic and quiet. There is a sense of interiority, and all of those emotions that he keeps inside of himself are powerfully expressed because he’s a very charismatic actor. Gabin has the ability to express a lot through the way he looked, and through the way in which he moves. When you see him move around his bedroom there is a sense of doom that is expressed in just the way that he throws himself on the bed. If you think of Jules Berry as a very theatrical actor, then Gabin was a very cinematic actor. But it needed the camera, which picks him up in close-up and expresses all of those feelings just by looking closely at his face. There is even a point in the film where he looks at himself in the mirror, and he can’t bear it so he smashes it. It’s a performance style that works on interiority, and is a minimalist performance. Yet at the same time you know that there is repressed anger and energy, and then it all comes out when he shouts out of the window at the crowd. Jean Gabin was well known in his films for always having a moment when he would explode and shout; in which all of that repressed energy would somehow come out. I’d actually describe this film as a masterpiece of language. From the opening use of sound to Gabin’s performance, Carné's masterful construction of the image, and Prévert’s wonderfully lyrical and poetic dialogue. Le Jour se lève is a marriage of the dialects of cinematic language. GV: It's a film that is one of the best examples of what is known as poetic realism. It’s almost an oxymoron – it’s realistic yet it’s also poetic. You have this attempt of the construction of a world that is realistic – the way the building looks, Gabin’s performance and the way he is dressed. But at the same time each image is very poetic, and that last image where the fog [teargas] invades the room is a beautifully poetic image. Also, and this is more difficult if you are not a French speaker, but the language of Jacques Prévert; the words he writes are extremely beautiful in French. So it is the language of ordinary people at that time, especially as spoken by Gabin, whilst Prévert’s use of language is also very poetic. Looking back at the evolution of French cinema, it is interesting in the way that it has been intertwined with American cinema, which has resulted in each reinventing one another. How do you perceive the journey of French cinema from Le Jour se lève to the present day, and how different is the cinematic landscape of French cinema now? GV: Well that is a big question, and I think one way in which this film goes is in the direction of American film noir. The term film noir is always thought to have been applied by the French critics to American cinema after the war, but in fact it was applied by those French critics to films before the war - films such as Le Jour se lève. One of the films legacies is therefore on American film noir, and especially the tragic doomed male hero and the use of lighting. The way it has influenced French cinema itself is difficult to generalise, because there are such a variety of French films made – about two hundred films a year. So it is hard to pin it down to one particular trend. I think you could say Jean Gabin has had a legacy in a number of ways. There is a tradition of crime films in French cinema that have been quite strong, and originate in those films of the 1930s. But if you look at the style of Gerard Depardieu - when he was younger - you can very much see that he is influenced by Gabin or stars like Alain Delon or Jean-Paul Belmondo. But at the same time I would say that the tradition of the thirties films about working class backgrounds is more difficult to find today. What you might see as an equivalent from the eighties onwards are films about ethnic minorities – a film like La Haine, which was made in 1995 with working class boys in the suburbs of Paris. You could trace that back to Gabin and Le Jour se lève. So there are ways that legacy exists, but at the same time there are no films made today that are like the poetic realism films, because these were very historically contained films. The nature of cinematic performance has changed - the way we write and score films, the way we move the camera. Is it because of this change that contemporary cinema offers a different feeling to the films of the past? GV: I think that certainly what happens in French cinema is that you have different periods. You have people like the French New Wave who want to challenge what is essentially classical cinema – a way of making well made, well-constructed films that are filled with good dialogue, which are in a sense a kind of classicism - and this reaches its best expression with a film like Le Jour se lève. At the same time it is also true that classicism does continue. I just reviewed a film for Sight & Sound called Going Away, a French film which will come out soon. Of course it is very different, and the one difference is that it is shot on location, as many films tend to be nowadays as opposed to in the studio like they were in the 1930s. But in many other ways there is an attention to the social background of the characters, there are good performances, and there is an attention to the script. I think that spectators still enjoy classically constructed films and whilst I think they continue, they adapt at the same time. You would not expect for it to remain the same, but I think it is more a question of seeing that they are different parallel strands, and they are something that we always want to challenge in order to blow apart the language of cinema, and make films in a very different way - very avant-garde films. But you do also find films that are much more classically constructed, and which are often very popular. So it continues in that way, but of course the technology has changed as well. Listening to Gabin in this film, and listening to French actors today, the way people speak has changed. But then the way people speak outside the cinema has changed, too. And of course film has to reflect that as well. You can’t find the same kind of filmmaking. But at the same time the pleasure of watching Le Jour Se Leve is precisely that it is different from what we do today.